I hate giving Marc strips with five panels. Believe it or not, I try to strip these things back as far as I can. If I can get it down to one panel, I will, but as you all know that almost never happens. Marc had a real challenge here. He had to set up a new scene and get through all the exposition to pave the way for the conversations coming next. Not small feat. As for that last panel… how tough do you think that beating was? Been writing character backgrounds for the SuperFogeys Sourcebook and Adventure Game like crazy lately. I hope you guys do pick up this book, even if you didn’t contribute to the Kickstarter. I’ve injected the bios with untold stories and additional insight into the characters that I just haven’t had room yet in the strip to make clear. I do believe the book will be more than worth your time. Super Knocker is being gullible if he thinks they cam all this way just for Doc Rocket. I don’t know man… he did kill a whole bunch of them. Revenge can be a powerful motivator. Just ask Django. Or Beatrix Kiddo. Or any character in any Tarantino movie ever. Can’t say I’ve ever watched a Tarantino movie. In every good mobster movie I’ve ever seen thoguh revenge includes killing friends, family, neighbours, and pets. Been wondering. Why is Dr. Rocket stuttering again? I noticed it previously, but thought he was just cold. Maybe I’m just misunderstanding. Let me put your mind at ease… the stutter is not indicative of anything. The first time he stuttered in this chapter, he was cold. The second–this time–he’s been beaten up pretty severely. The stutter merely reflects those two things. But, given the history of this strip, I can certainly see why your mind might go elsewhere. Yes, I’m buying the book! Just let us know when, where, and how much. I have always said that a bucket list goal of mine is to do a voice for a villain in an animated show, and specifically to say “You’ll never get the power crystal, you fool!’ or something involving a power crystal. I love that she says that here. Tom, I’ve said it before and I’ll say it again… you would be sooooo good at that. How tough do I think that beating was? Not tough enough, Brock, not tough enough. Because Dr Rocket is still alive. With only the admittedly formidable help of Harvey he trounced all these aliens before. I doubt he came back to earth – the most obvious place to look for him – without a few more precautions than just hiding the power crystal. You write your characters far too well for me to believe he doesn’t have a few more cards up his sleeve. In a dream world I see an army of “Night of the Lepus” giant man-eating bunnies descending on the aliens. I can’t help but wonder if Dr Rocket knew this would happen when he used the crystal since he most likely could have used another power source for the robot. As Spy Gal said, he was responsible for the majority of giant robots she fought and he didn’t use it to power them. Maybe the last thing on his bucket list before the cancer gets him was to finish what he started and kill Pilatius. Finishing off the last Jorbons – the one he hates and regards as his real enemy – would not only satisfy his revenge, but in terms of pure evil completing his extermination of an alien race would be a sort of unholy “crowning achievement” to his legacy as the most diabolical villain of all time. He could have just used the crystal to lure him to Earth. What’s all the accompanying death and destruction to someone like him but icing on the cake? It also just occurred to me, can we really trust that he has cancer? Faking an illness would hardly be the worst thing he’s done to get what he wants. See how paranoid you make your readers? God Job! Thanks man, I love that you’re thinking that deeply. Doc’s motivations are his own, but I’m sure we can look forward to them coming to light one day. Though he’s taken a bit of a back seat lately, you are correct to assume that his wheels are always spinning. Not tough enough, indeed. It was only one, and over a course of (maybe) days. The Jorbons beat him for years. This is nothing. An excellent point. One that will serve you well in your interpretation of what’s to come. Loving the strip so far but what is a ‘muderer’? Did you mean to say ‘murderer’? in the first panel. What you saw was an early version of this strip with a typo. If you’re still seeing it, hitting refresh on your browser should fix the problem. Thanks! Of course he’d talk. He gave the crystal to Jerry, and he’s not exactly on good terms with him. 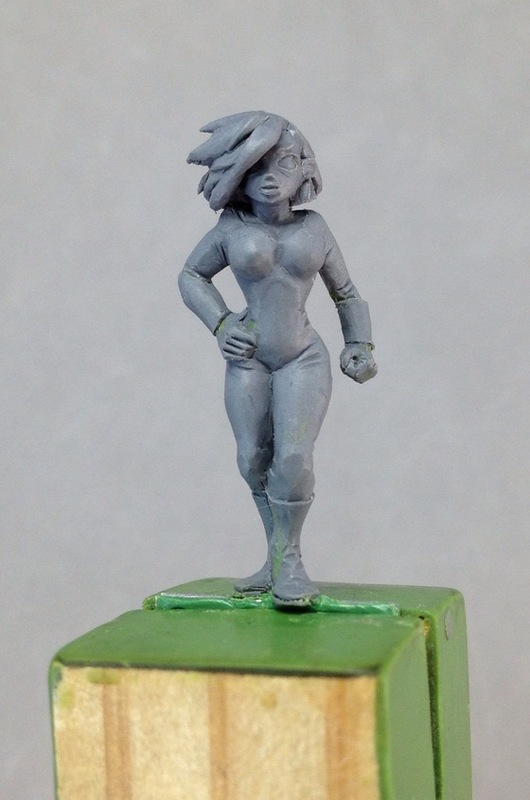 Hey all, I know you’ve been patiently waiting for your Sourcebook & Adventure Game and we’re working real hard behind the scenes to get it out to you as quickly as possible, but I thought you’d like to see a little something Paul Lidberg over at Team Frog Studios posted this past week–The Spy Gal figure sculpt! This was a late addition to the Kickstarter–you guys juuuuust made the goal in time to unlock Spy Gal. And I’m so glad you did. She looks incredible and, somehow, sculptor Gene Van Horne got her hair right. That’s tough to do. Believe me, I know. Thanks again everyone for your incredible support of this project. Books coming soon! You can read all of the most recent updates right here.